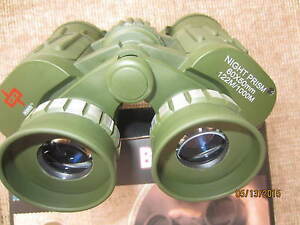 Day/Night Prism 60x50 Military style Binoculars 60x Magnific. binocular4you has no other items for sale. Sales tax may apply when shipping to: CA*(8.25%), IA*, MN*, WA*. I use them at night my security job. The low light capabilities is phenomenal. I couldn't get them to focus at first, then I read the instructions. Best pair of binoculars I've ever owned. I've had older high end optics and these are better. Suggested for sure. Outstanding product and perfect experience at distance looking object. These binos are easy to use and lightweight. The zoom is adjustable and it gives clear view of distant objects. Great for all occasions!! I was looking for a decent pair of inexpensive binoculars and these do the trick. They have more magnification than I need, but I can put them on a tripod (take off the button where the front lens caps attach). You can use them for astronomy since they have the 20 magnification and are nice and bright. Again, not really stable, but they can be put on a tripod. I would say they are much better for nature than handheld astronomy, but you can do both. I'm happy they seem properly aligned for this price. excellent for the price i paid.